To Cite: Fathi M, Hassani M, Jafari M, Joudi M, Habibzadeh R, et al. Hypnosis as an Alternative to General Anesthesia for Orthopedic Hand Surgery: A Case Report, Ann Anesth Crit Care . 2017 ; 2(1):e17481. doi: 10.5812/aacc.17481. The effectiveness of psychological techniques such as patient education, cognitive and behavioral interventions, relaxation techniques, hypnosis, therapeutic suggestion interventions, and emotion-focused interventions has been assessed through the outcomes of postoperative pain, perioperative anxiety, quality of life, and recovery in adults. In this case presentation, we introduce using of hypnosis as an approach to pain control in hand surgery. The most commonly injured part of the body is hand (Gaul, 1987; Pulvertaft, 1992) and its surgery is usually associated with pain and anxiety. Painful stimulus shortly after orthopedic surgery is a complication reported by patients with hand surgery because the movement and function of hands and fingers are necessary to daily activities. Further, psychological suffering can lead to dysfunction or disfigurement of hands that finally affects the life of individuals and society (1). Hand injury can hugely affect the quality of life of patients. In fact, such injury may cause psychological and social problems that can interfere with individual and social life of patients (2). One critical aspect of psychological factors is their effect on recovery from surgical procedures, which is associated with pain and anxiety. Anxiety has been shown to play a critical role in recovery as it increases the level of perceived pain in patients (3-6). Acute pain interrupts the body’s natural healing response (7-9). Overall, postoperative pain can delay patient rehabilitation, increase length of hospital stay, elevate medical costs, and decrease the quality of life (10, 11). The effectiveness of psychological techniques such as patient education, cognitive and behavioral interventions, relaxation techniques, hypnosis, therapeutic suggestion interventions, and emotion-focused interventions has been assessed through the outcomes of postoperative pain, perioperative anxiety, quality of life, and recovery in adults. A well-documented and long-established non-pharmacological pain treatment is relaxation and analgesic suggestion (medical hypnosis) (12, 13). Medical hypnosis is a treatment modality used in some countries. The useful role of hypnotic interventions has been shown in medicine and dentistry, postsurgical recovery (14, 15), and pain control (13). Since the first half of the 19th century, the link between surgery and hypnosis has been shown in many studies. James Esdaile, the most notable early hypnoanesthetist, reported over 300 major surgical cases using mesmerism as the only anesthesia (16). Hypnosis is still used for surgical anesthesia in some individuals, particularly in patients who prefer this approach or are allergic to chemical anesthesia. The use of hypnosis rather than chemical anesthesia in surgery patients has been reported recently (17), and a high successful rate has been documented (12, 18, 19). This paper discusses the use of hypnosis as a non-pharmacologic intervention for postoperative pain intensity and anxiety, which can improve postsurgical recovery in the patients with hand surgery. The patient was a 32-year-old man who suffered from hand and leg injury 5 years ago. He had undergone surgeries 13 times and a device was implanted in his first and second metacarpal bones. He was scheduled for hypnoanesthesia due to his persistent request to reduce sever anxiety. In the operation room, standard monitoring including electrocardiogram, non-invasive blood pressure monitoring, and pulse oximetry was provided. Also, bispectral index (BIS) monitoring was used to measure awareness. After prep and draping of the left arm, the hypnosis induction was performed by a hypnotherapist who was also an anesthesiologist (the first author) via eye fixation and verbal suggestion technique. The deepening of hypnotic trance state was triggered by fantasizing a garden and focusing on flowers and bird flights. Ideomotor signals of deep trance in patients appeared as inflated brachial tourniquet up to 300 mmHg. 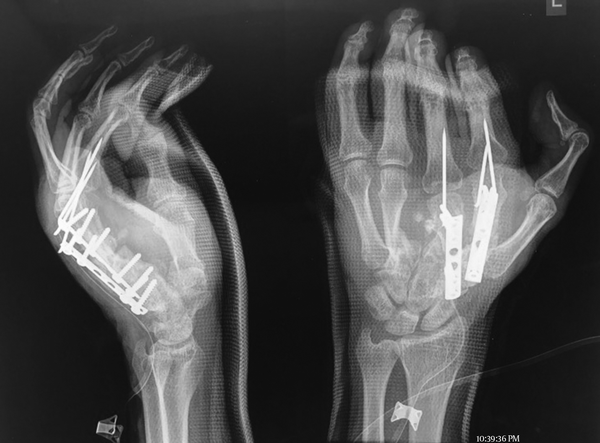 The dorsal zone of left hand was incised and the device (Figure 1) was removed after 40 minutes. Left arm tourniquet was inflated for 30 minutes and electrocauterization was used for coagulation and bleeding control. During the surgery, there was no significant change in heart rate and blood pressure compared to the base. BIS score varied between 92 and 98 throughout the surgery. Also, the heart rate was 78 - 85 and blood pressure was in the normal range (110/70 - 125/85). The patient was in hypnoidal state and kept talking with the hypnotist and surgeon during the surgery. At the termination phase of hypnosis, the patient was conditioned for post-operative analgesia. He was discharged from the hospital in full awake state 2 hours after the surgery. The follow-up was implemented 6 days after the surgery with the results indicating painless state without any analgesic drugs. In this case presentation, we introduced the first open-hand surgery via hypnosis rather than general anesthesia. Hypnosis was used to induce calmness and control pain during and after procedural states (20, 21). Also, the effective role of hypnosis in pain control during surgery as an alternative to general or neuraxial anesthesia was shown (22). Renner et al. used hypnoanalgesia to control pain in patients with abortion, finding that analgesic drugs could significantly reduce patients’ pain (23). Dufresne et al. also applied hypnoanalgesia to 290 women with abortion successfully (24). In our case, no response to inflated tourniquet and electrocuterization was observed, indicating that hypnosis may be a reliable method for nerve block or general anesthesia. Moreover, lack of postoperative pain was another advantage of our study. Both surgeons and patients were satisfied with the results of hypnosis. The results suggest the importance of familiarity with hypnosis for anesthesiologists. Accordingly, the training of hypnosis could be incorporated in the curriculum of anesthesia post-graduate students. 21. Joudi M, Fathi M, Izanloo A, Montazeri O, Jangjoo A. An evaluation of the effect of hypnosis on postoperative analgesia following laparoscopic cholecystectomy. Inter J Clinical Experimental Hypnosis.